An argument that began inside a midtown McDonald's restaurant early Monday erupted in gunfire at the steps of a nearby subway entrance when a gunman shot three men, one fatally, near Penn Station, authorities said. 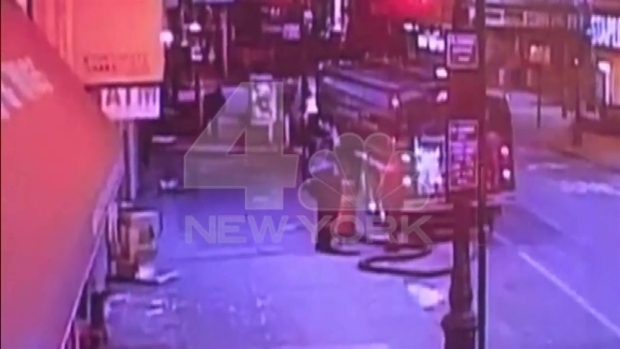 The three victims, all men in their 40s, were drinking coffee when a heavy-set man in a black hooded sweatshirt engaged them in a brief conversation, left the restaurant and then waited for them to exit, following the group into a subway station, where he fired four times, NYPD Chief of Detectives Robert Boyce said. "The nature of the dispute is being investigated now," he told reporters outside the subway entrance at 35th Street and Eighth Avenue, where a wooden cane could be seen resting on the subway entrance's top steps. Police said they were investigating whether narcotics may have been a motive in the shooting. They said they've made 52 arrests so far this year in front of and inside the McDonald's at 35th Street. The shooting itself was in the entrance to the subway, not in the transit system itself, in an area where there are no security cameras, Boyce said. One man was killed and two others were hurt in a shooting outside a McDonald's near Penn Station in Manhattan Monday morning, officials say. All three men had lengthy arrest records for mostly drug charges, an official familiar with the investigation told the Associated Press. No arrests had been made and investigators were searching for the gunman and possibly two others who may have fled north on Eighth Avenue in a dark car, officials said. Torres, who was speaking to detectives, provided much of the narrative to investigators, Boyce said. The other victim, Lamboy, was transported to the hospital in critical condition, officials said. Two men who attend a nearby methadone program at the West Midtown Medical Group, about a half-block from the where the shooting took place, said they knew two of the victims, Quinones and Lamboy. They said both men came to the clinic for years. "They were real nice guys, straight guys," said Michael Gessow, 39, of the Bronx, who said he has been coming to the clinic for 10 years. "I can't believe it." Richard Buckley, 59, said he was shocked. "I've been coming here for 14 years and I've never seen anything like this happen," he said. Samuel Ramsey, the director of operations for West Midtown Medical Group, said his organization had been contacted by police but couldn't comment on the shooting because of medical privacy concerns. He said the outpatient, substance-abuse program, which serves roughly 900 people, has been around for more than 20 years and has no history of violence.